What are net carbs and why do I need to keep track? The question I get asked most often is what are net carbs? One of the things that confuses people is how to calculate net carbohydrates from total carbohydrates. When you try to figure out the Net Carbs in a food you simply subtract the grams of fibre from the total carbs. So, if a medium sized red plum tomato has 3 grams of carbs, you subtract its 1 gram of fibre leaving you with 2 Net Carbs (NC). Fibre doesn't interfere with your body's ability to burn fat as it has no impact on your blood sugar levels. That's why we don't count it. 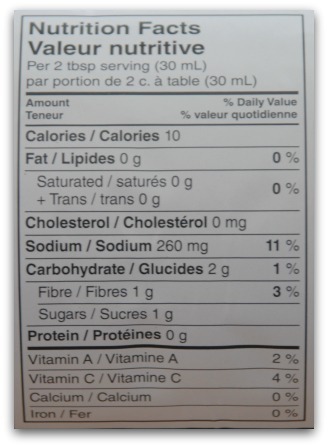 If you're using packaged food, read the nutrition facts label. Find the total carbs and then subtract the fiber. When you're loading up your plate be sure to only dish out the serving size listed on the label. If it says Per 1 cup serving and you dish out a cup and a half, you'll have to do some recalculating. In the example here, the serving size for this salsa is 2 tablespoons. The total carbohydrate is 2 grams. The 2 grams are made up of 1 gram fibre and 1 gram of sugar. So the difference is 1 gram NC. The best way to keep track of your carbs is by keeping a food journal. At first it may seem tedious but in time you'll get used to it. Keeping your meals really simple in the first few weeks will ensure you're off to a good start. In no time at all you'll be able to recite the Net Carb counts for a wide variety of foods. Something else to consider is sugar alcohols (polyols) found in sugar free food products. You'll see them listed on packaging as sorbitol, mannitol, glycerin, xylitol, lactitol, maltitol, isomalt and erythritol. Because they have such a minimal impact on blood sugar levels, they too can be subtracted from the total carbohydrate count. Just a note of caution, sometimes you can experience a laxative effect from eating sugar alcohols. And in some individuals, some low carb sugar-free meal replacement bars and shakes can stall weight loss efforts. Proceed with caution. I always say, "Eat. Real. Food." It's a good idea to keep track of your protein and fat as well. We all have individual needs. An active 6'4" man has a very different nutritional requirement than a 5-foot tall woman who is mostly sedentary. Now that you know what are net carbs, let's have a look at your protein and fat requirements. Or let's go from What Are Net Carbs page back to the Home page.